Epiel JSC was set up in 1998 in Zelenograd, Moscow with the aim to provide Silicon Epitaxial Wafers and Epi services for bipolar IC and power device manufacturers in Russia. In a short period of time the company established itself as the leading independent Epi provider in Russia. 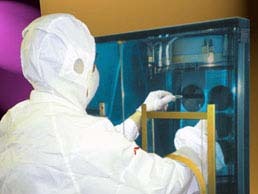 This was largely due to concentration of the best Silicon Epitaxy specialists in Epiel as well as continuous facility and technology improvements. Epiel today is the largest supplier of Silicon Epi Wafers and Epitaxial Services to the microelectronics industry in Russia and the CIS.